Is It Difficult To Plan Meals With A Busy Family? The average family schedule includes work, school, sports practices, tuitions, meetings and birthday parties throughout the week. Trying to figure out what to cook at meal time is often a challenge. Planning meals ahead of time offers a solution for busy families. A family meal plan requires some work ahead of time, but the menu saves the time throughout the week. You won't have to search for something to cook when everyone is already hungry and tired after a busy day. Having a meal plan in place can also help you avoid the temptation of take away often. This means you feed your family healthier food and also sit down to a meal together each night. Your family meal plan involves a menu that outlines the food you plan to serve each day. A calendar-style layout works well for recording the daily meals. A list of meals your family likes to eat is a useful reference for meal planning. Refer to the list as you fill in the menu so you do not have to come up with meals on your own. 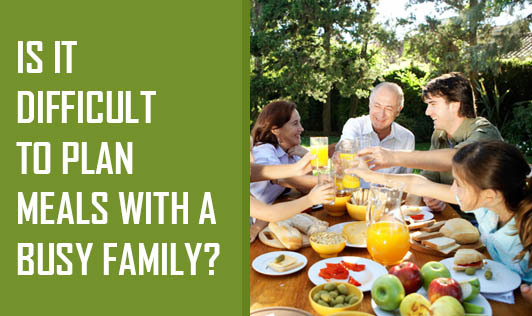 A family's schedule influences the meal plan. Keep a copy of the family's upcoming commitments and activities as a reference when planning meals. On days when you have lots of commitments, schedule meals that are fast and simple. Keeping the meal plan flexible is also a convenient trick for busy families. If there is an unexpected commitment, then replace that night's meal with something easier and simple. Now have a home cooked meal with your family everyday!